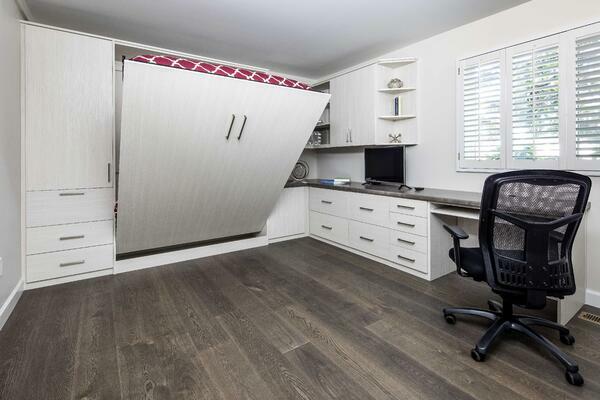 This homeowner was clearly reluctant to commit the majority of the floor space in her second bedroom to a typical bed would be unused most days of the year. Besides, she really wanted to use that room as a home office. 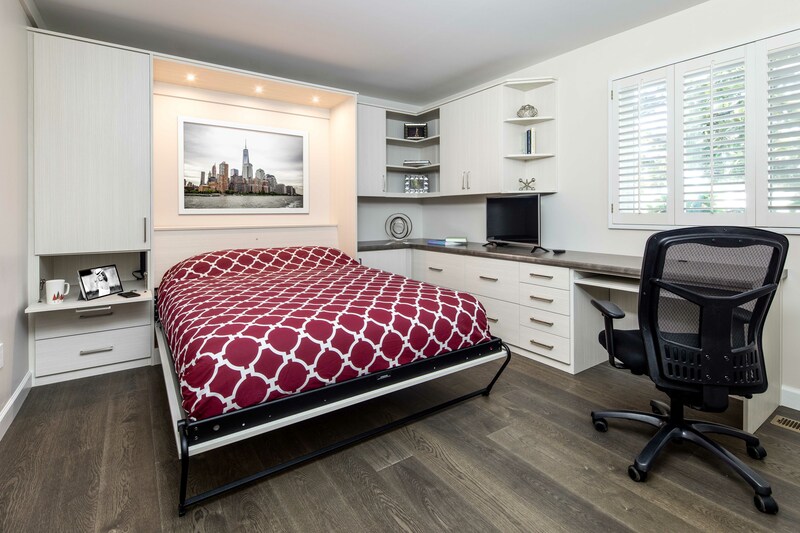 This is where a custom wall bed unit, seamlessly integrated with a built-in home office, became the answer to meet her needs. I dedicated one entire wall in the second bedroom to the wall bed. We decided on a queen-sized bed, which is the most popular size. It’s large enough for two to sleep comfortably and fits easily into most normal-sized rooms. To one side of the bed, I designed cabinets configured to add usability and comfort for guests. The fold-down door to the bed-height side cabinet creates a side table within easy reach. I even included plugs inside that space, so guests can charge their cell phone without having to crawl around on the floor looking for an outlet. A large cabinet above the side table allows them to unpack and make themselves at home while two drawers below give added space for storage. The LED task lighting eliminates the need for side table lamps, and there is even room behind the fold-out bed to hang artwork for that added homey touch. When the guests go home the bed can fold up, and my client has the entire floorspace to use on a daily basis. To make sure her home office was streamlined and clutter-free, I designed the entire unit with her work habits in mind. The desk area sits in front of the large window to make sure she can enjoy the outdoors even when in the midst of work projects. A pull-out keyboard shelf under the desk helps her avoid wrist and shoulder issues. Easy-to-reach file drawers and a printer on a rollout platform keeps everything she needs at her fingertips. Display shelves for collectibles are interspersed with closed cabinets. Now she has all the essentials for running a business only inches away while maintaining an elegant and tidy workspace. Since each space I design is custom-tailored to that homeowner, every project starts and ends with their needs in mind. 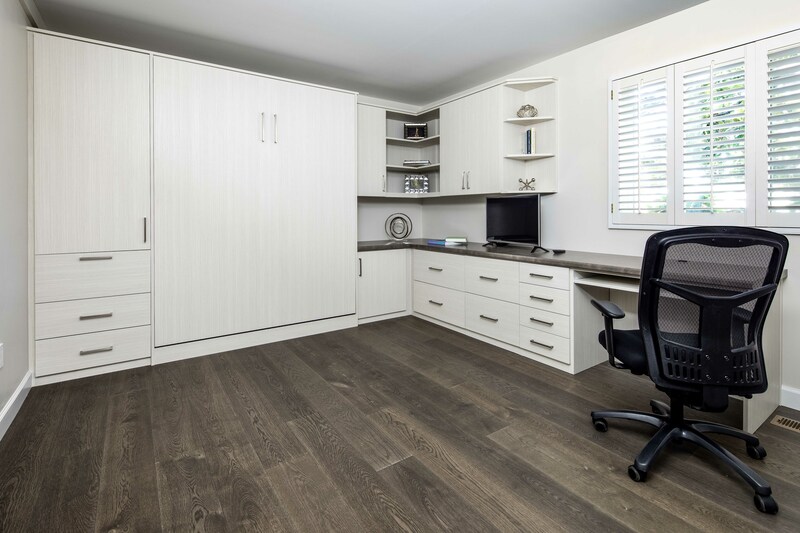 Call or stop by Valet Custom Cabinets & Closets to see how we can help you maximize the use of your space. Mark joined the Valet Team in 1999. His years of design experience with Valet together with a 17 year background in the home improvement trades gives him a wealth of knowledge that is rarely seen. 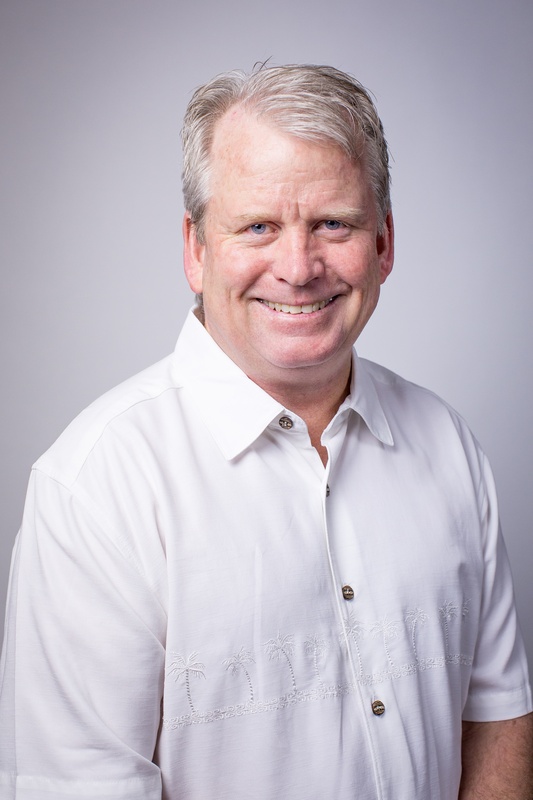 Mark and his wife Sandie have been married since 1979 and reside in San Jose with their son. Mark’s interest included racquetball, skiing and golf. He also enjoys spending time on the Monterey Peninsula. Both homeowners and contractors value his complete understanding of all aspects of construction.